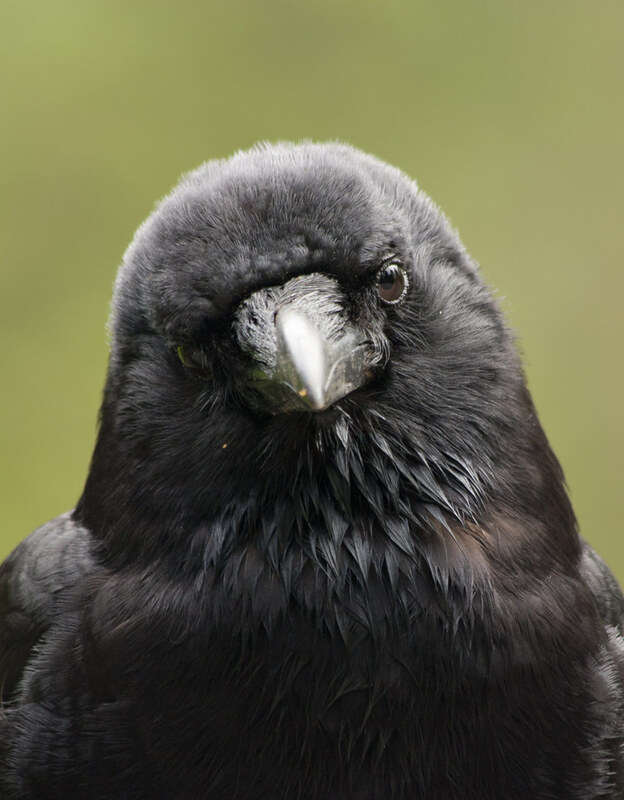 I think this is my most popular crow picture. I have shot hundreds of others, but this one particular inclination of the head seems to captivate people. Many photographers struggle to find models, often paying lots of money to professional agencies or resorting to Model Mayhem to recruit on-camera talent. In Vancouver, I have found a huge selection of beautiful models who will work for peanuts. Literally. One of my favorite activities in bird photography is to assemble a group of hungry crows in order to hone my camera technique and practice my timing Crows are photographically challenging due to their dark tones, but repeated efforts will yield nice results. 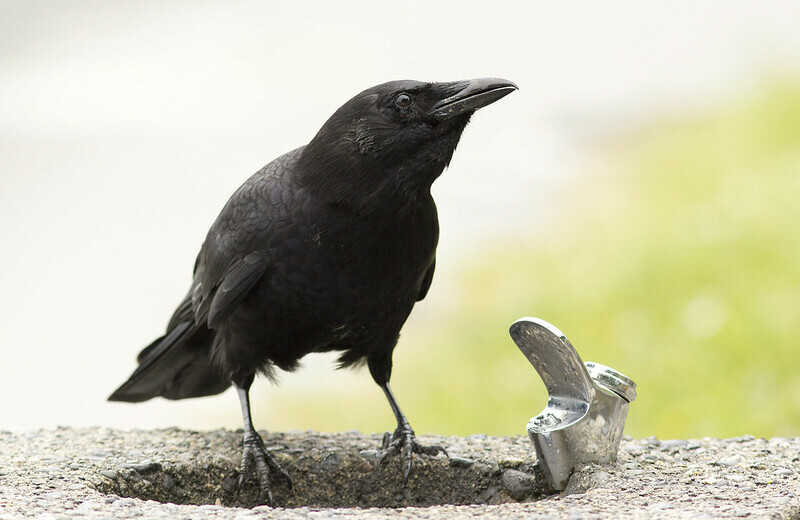 These abundant city crows are used to scavenging human refuse and soliciting handouts, so feeding them does not risk altering their survival skillset. They will approach closely, so shooting them with a 50 mm lens is definitely doable. Contrasting the dark detailed plumage with saturated creamy backgrounds makes for a great portrait. Longer focal lengths are usually needed for this. What I love especially about these birds is their curiosity and mannerisms that call to mind their intelligence. 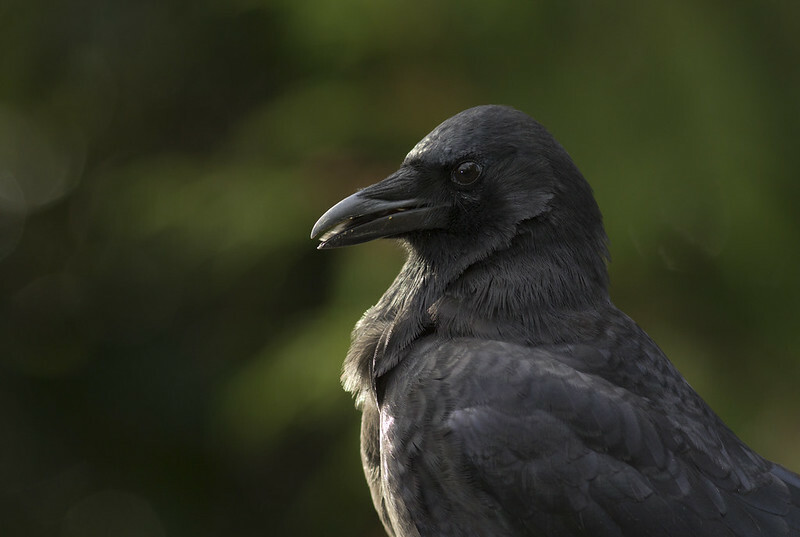 In the Vancouver area, there is a high abundance of crows, who (when not rearing young) fly into the city at dawn from huge communal roost sites in Burnaby. These birds are headed from Coquitlam into Burnaby for the evening . The daily migration gathers birds from all around the area. Because they are such willing subjects, I can experiment with different lighting styles, even overused hipster clichés. lens flare and loss of contrast due to light source close to the subject. A no no or an interesting effect? What I find most intriguing is how individual birds look so different from one another. In this shot, the preening crow looks almost raven-like. I can show context or isolate. This was shot in Victoria in the spring, with blooming camas in a Garry Oak meadow. One of the best things about working with an urban social species is that they go about most parts of their lives in front of humans, so they do not alter their behavior because of fear. So I try to catch natural behavior as well, such as calling, anting, foraging, playing, and allopreening. During nesting season, the crows get a bit more reluctant to share their space with us. Get your fresh water where you can. Crow love. 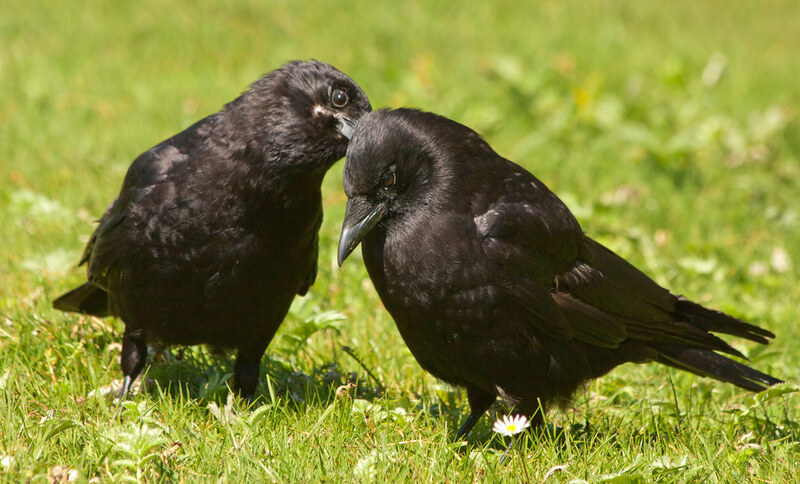 Allopreening (mutual grooming) is common in pair bonding birds. It probably arises in other situations also. The red gape of this begging juvenile will disappear and become black like an adult. Also note the brownish tone of the juvenal countour feathers. 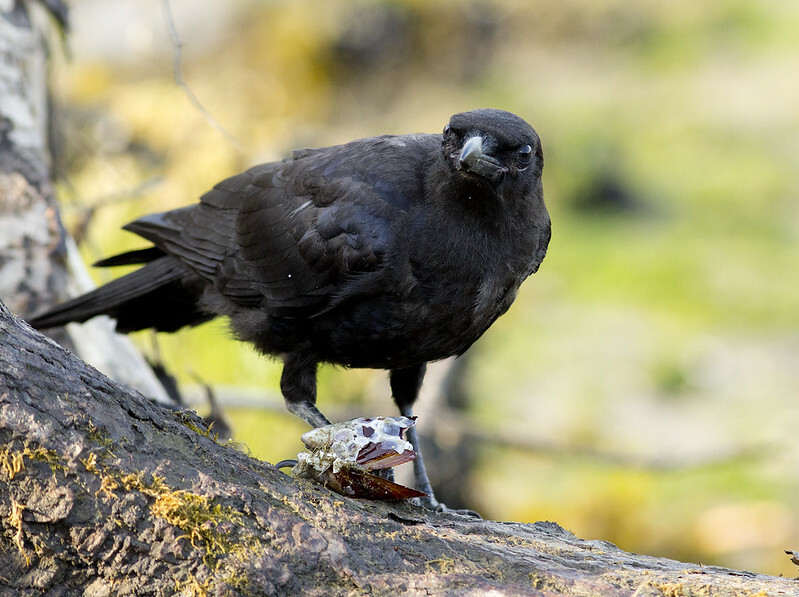 Another juvenile crow, this one learning how to forage on shellfish. Many many interesting moments can be had in rapid succession with a group of crows in attendance. 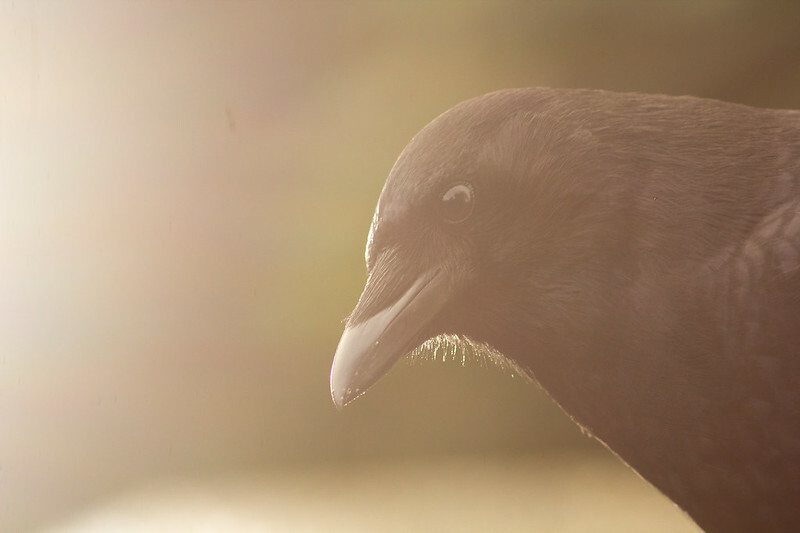 All in all, I think the crow makes a worthy model for future photographic study. I keep returning to them for inspiration and practice. There are so many more behaviors, looks and moods I would like to document. 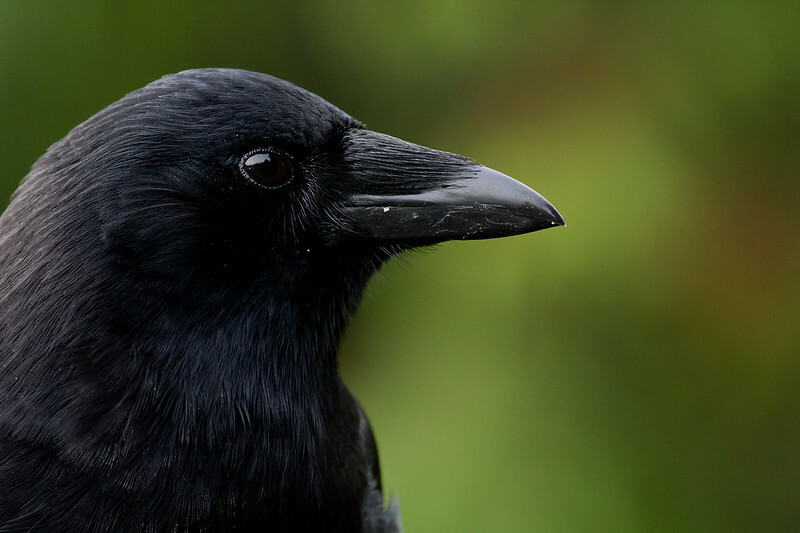 When nothing else is going well, a photo session with crows can always boost my morale and stir my imagination. What kind of familiar subjects do you return to? 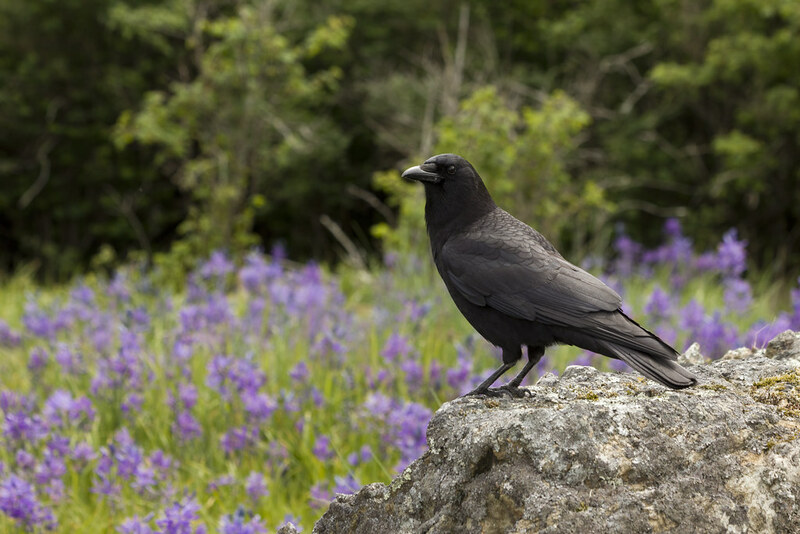 Go out and try some crow photography, or shoot whatever is your local equivalent. You may find that you return again and again for inspiration. 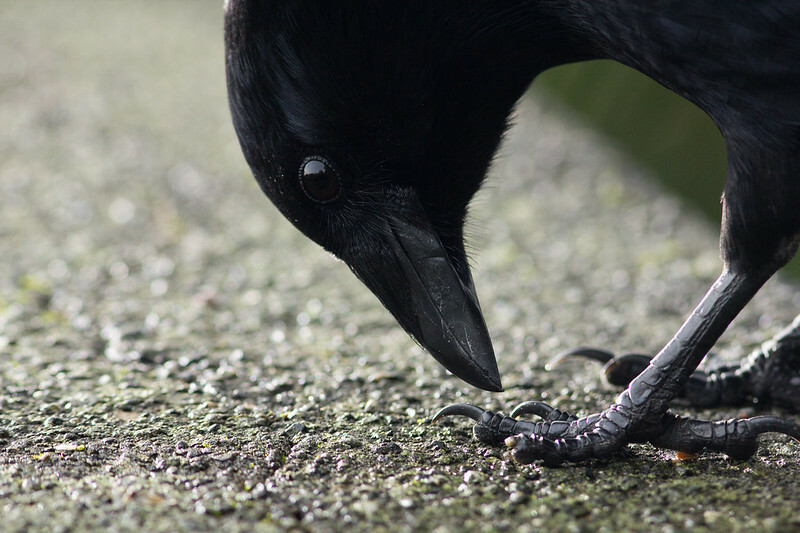 I love these crow shots. They have personalities….and you capture them so well. Thanks. Wonderful stuff! I may just kidnap you and force you to go along on my holidays to photograph birds for me. GET IN THE SUITCASE! No prob! As long as the cargo hold is pressurized! Yeah, Sean, that first shot is special! Like you said, the tilt of its head makes it look rather endearing to humans. 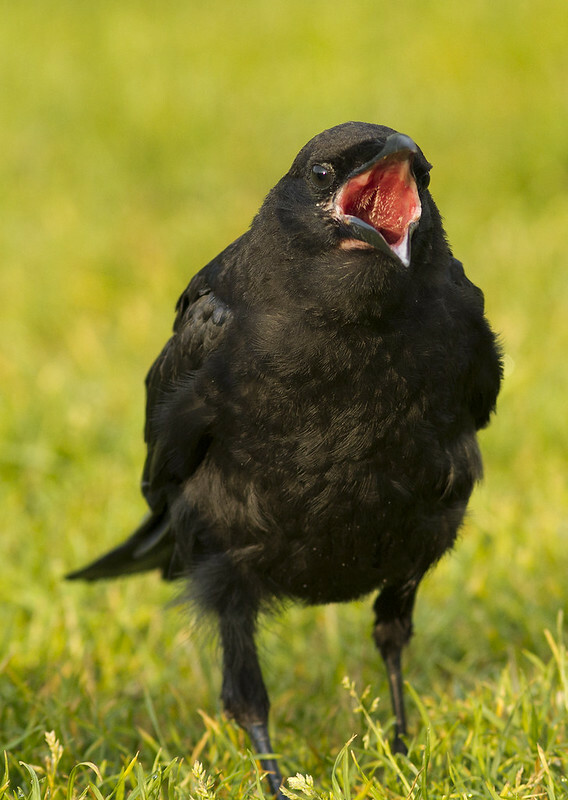 I love crows! Sadly, crows can’t stand me – at least those in my neighbourhood. 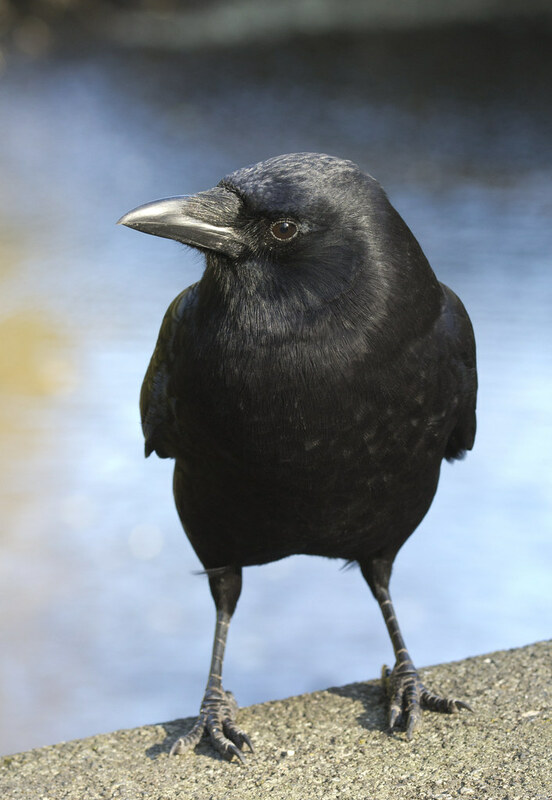 They’re not as smart as ravens but they’re very observant birds & can easily put two & two together. It’s why they mistrust me so much. I’ve noticed crows will watch from trees nearby as I put out some dogfood for the visiting mom raccoons & kits. They’ve also watched as I cared for a couple feral cats that have come around. 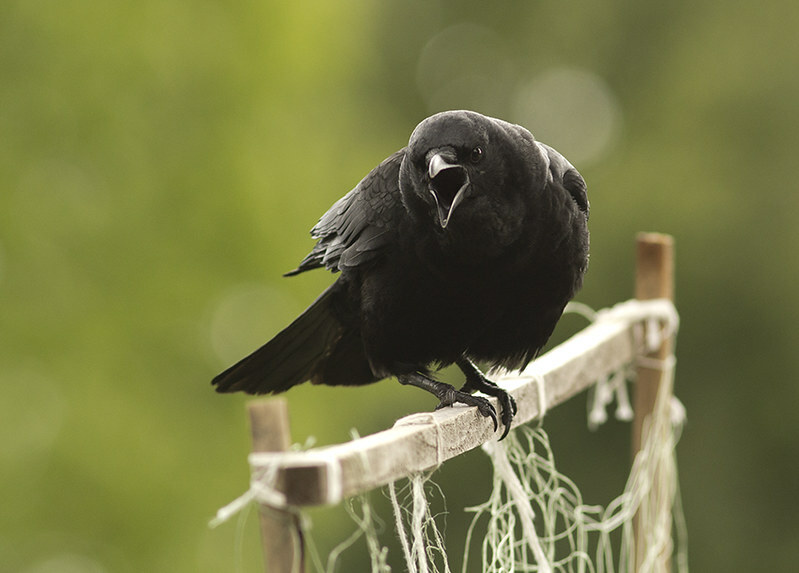 Crows consider both cats & raccoons as enemies. I figure they think any friend of their enemies is also an enemy. Sometimes, just by myself out in my backyard, the crows will give their warning caws when I go out. I really feel slighted as I’ve put out food for them too & always make sure there’s plenty fresh clean water each day for whoever needs it. But do I get any love from them? Ha! I’ve tried for a number of years & no success so I decided to just continue to care for them & accept their opinion of me. 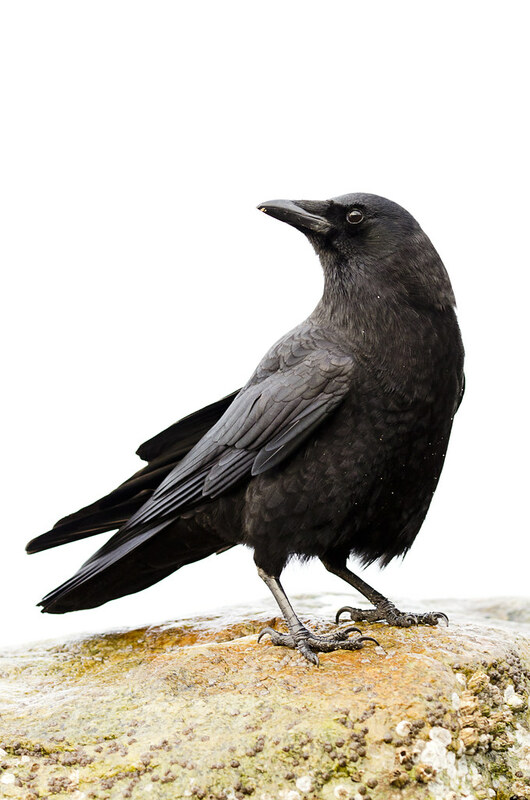 When I had gone to UFV (U of Fraser Valley) during a session in spring, I saw a crow with the end of the upper half of its bill broken off. It was having a hard time picking up food – almost impossible. I watched as another crow would come over & hold food in its beak, making it easier for the handicapped crow to take. I felt bad & expected it wouldn’t survive long. 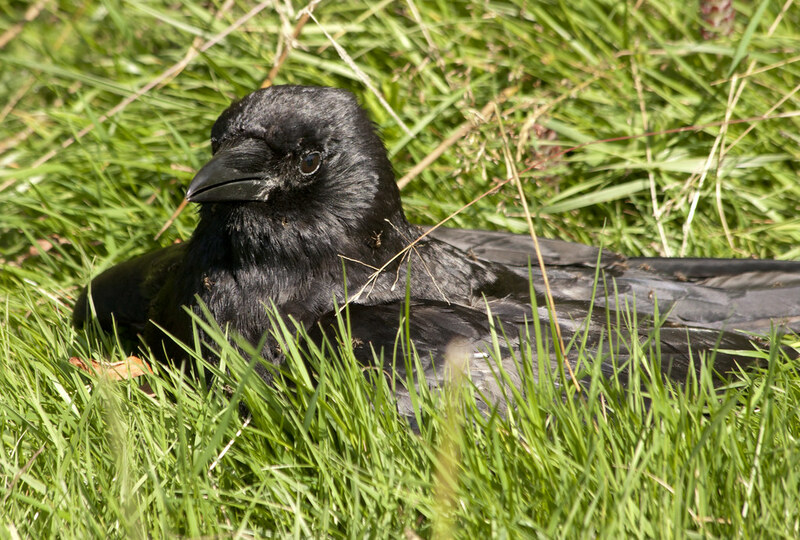 But when I came back in the fall, that crow was still alive & looked to be in good shape. 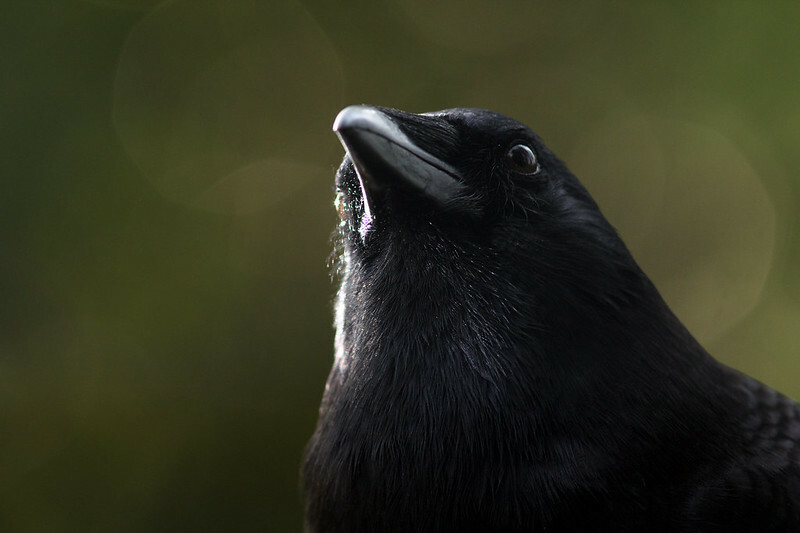 That altruistic example only serves to make me love crows all the more. Yeah, they do seem to care for each other! They are tough and resourceful, and always fun to watch. I notice that outside of the park (where they are used to being fed) they are also distrustful. I think out in the neighborhoods, and especially in the country they have good reason to fear people.